Citation: Green, John. The Fault In Our Stars. New York: Penguin Books, 2012. 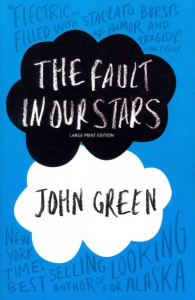 Reliability: I could tell The Fault In Our Stars was reliable because the author, John Green is very popular and has written many other successful books. This one in particular has been TIME Magazine’s #1 Fiction Book of the Year, #1 International Bestseller, #1 Indie Bestseller, #1 Wall Street Journal Bestseller, USA Today Bestseller, and #1 New York Times Bestseller. It also has excellent reviews from TIME Magazine, Entertainment Weekly, The Atlantic, NPR.org, The Sacramento Bee, People, Parenting, Booklist, starred review, Markus Zusak, author of The Book Thief, and Jodi Picoult, author of My Sister’s Keeper, and Sing You Home. 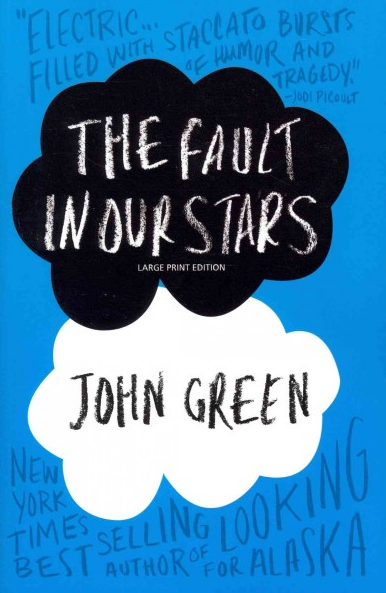 Category: The Fault In Our Stars follows a problem solving pattern: person versus nature. In this case, nature is a disease. Hazel Grace and Gus , meet in a cancer support group. Hazel, obsessed with a book which ends right in the middle of a sentence, lends it to Gus. A charitable organization has promised Gus a dying wish, and so the two cancer patients fly to Amsterdam to meet the author. What a disappointment! The author turns out to be a jerk. Hazel and Gus decide to make the best of their trip and enjoy the sights of the city, but during their last days in Amsterdam, Gus tells Hazel that his cancer has returned and spread throughout his body. After he dies, everyone around him is filled with grief. And so, the conflict in the novel is resolved in an unusual way. While it appears that nature – cancer – has won, Gus’s positive impact on so many lives means that he will actually continue to live in the memories of the people he loved. Short Annotation: Hazel and Gus, who are both fighting cancer, go on a breathtaking adventure together. This 313 page-novel vividly shows how many people around you appreciate you more than you think. “Late in the winter of my seventeenth year, my mother decided I was depressed, presumably because I…” (3). “Augustus leaned in so he thought I couldn’t hear” (15). “I’ll be at the food court” (41). “Issac leaned a hand against the snack table and focused his huge eye on me” (15). “My favourite book, by a wide margin, was An Imperial Affliction, but I didn’t like to tell people about it” (33). “I gave them a quick swipe with my T-shirt, laced the tubes behind my ears, and put the nubbins back in place” (47). “Mom was just idling” (20). “I don’t know why” (31). “I nodded. I like Augustus Waters. I really, really, really liked him” (31). “’I found her. I emailed her. She gave him the email. He responded via her email account” (67). In the end, we both lost. So it goes” (137). “…Staff Sergeant Max Mayhem…” (47). “’Get it get it get it’” (58). “’God, help me. God, help me’” (134). “The shirt was a screen print of a famous Surrealist artwork by René Margritte in which he drew a pipe and then beneath it wrote in cursive Ceci n’est pas une pipe. (“This is not a pipe.”)… ‘But it is a pipe.’ No, it’s not,’ I said ‘It’s a drawing of a pipe. Get it? All representations of a thing are inherently abstract….’” (178). “’They don’t kill you unless you light them,’ he said as Mom arrived at the curb. ‘And I’ve never lit one. It’s a metaphor, see: You put the killing thing right between your teeth, but you don’t give it the power to do its killing’” (20). “He was maybe ten, wiry and over energetic, and he kind of skipped across…” (133). Connection: My connection to The Fault In Our Stars by John Green is text to self. My family has had a lot of losses due to cancer. In 2013, we lost 3 people in 3 months. One of them was very close to my parents. He battled cancer for 7 years, and was in remission for a total of about 18 months. When he was first diagnosed, they found the cancer in his lungs, even though he had not been smoking. One third of his lung was removed. After that, they found a tumour at the base of his spine which caused him lose the ability to walk. The doctors then found lesions in his brain and lungs. The cancer was first found while his wife was pregnant with their first child. He did not start his medication until their second child had been born. There is a group called the Dark Horse Riders, which he took part in, who ride in a bike ride called Ride to Conquer Cancer. He used it as a distraction from being sick, similar to how Augustus distracted Hazel by taking her to Amsterdam. Every year, the Dark Horse Riders still ride in his honour and have his name on their bikes. Towards the end of his life, meditation was another distraction for him, and my mom was his guide. My mom says the meditation helped him appreciate his life, and while doing this, she learned to appreciate hers. Ganeri, Anita. Eruption: The Story of Volcanoes. New York: DK Publishing, 2000. I find this publisher, DK Publishing, to be reliable because this book is included in the DK Reading program and is designed in conjunction with Dr. Linda Gambrell who is a distinguished Professor of Education. Dr. Gambrell has served as the President of the National Reading Conference, The College Reading Association, and the International Reading Association. DK Reader books are guaranteed to capture a readers interest, develop their reading skills, apply knowledge, and generate a love of reading. The category of this book is informational pattern. There is a lot of information about volcanoes and how they are created and how and why they erupt. Volcanoes start off underground, where it seems like they are solid and hard, but inside the earth it is so hot that the rocks melt and create lava. When volcanoes erupt, they shoot ash, dust, and lava out of the crater that acts like a vent. When a volcano stops erupting, the crater then fills with water and becomes a lake or a dry, grassy plain. This nonfiction book tells information about the world. This non-fiction book about volcanoes describes, in words and vibrant pictures, how volcanoes are made and how they erupt. This 32-page book, written from the second person point of view, has great facts and pictures about volcanoes and how they erupt. Recommended for readers 7-10 years old. “…you jump up and down…” (6). “You can walk around the streets…” (20). “…they will poke up…” (26). “…because it always bursts…” (15). “Lava, ash, and dust…” (14). “…build roads, bridges, and houses.” (23). This book reminds me of a time when I went to Maui, which is one of the Hawaiian Islands. When I was in Maui, we saw a non-active volcano and it was extremely high up and you could see the crater filled with dark green vegetation. We drove up to the top of the crater and the oxygen level was low because I found it harder to breath. When we were at the top, I imagined what it would look like when it was erupting long ago. This non-fiction picture book made me remember my thoughts as I stood at the top of the non-active volcano wondering what it was like active. This book reminds me of the many active volcanoes around the world today. There are about 1500 potentially active volcanoes worldwide. About 50 to 70 of these volcanoes actively erupt each year and at any given time, including today, there are about 20 volcanoes erupting. Some only erupt with ash and steam coming out of the top as the lava flows underground, and others erupt with fierce violent bursts of lava erupting over the sides and down the mountain slopes. Volcanoes have been active in history, as well as around the world today. Peet, Bill. Cyrus The Unsinkable Sea Serpent. Boston: Houghton Mifflin Company, 1975. I know this author to be reliable because he has written and illustrated more than 30 humourous books for children. He became Walt Disney’s greatest storyman during his 27-year career, making animated films such as Pinocchio, Fantasia, Dumbo and 25 other Disney films. All of his books were published by Houghton Mifflin Company and remain active in print today. I think the category of this book is a problem-solving pattern because in this picture book the problem was solved in the middle of the book. Pirates were trying to take over a ship by destroying it. Cyrus, the serpent, saw that they were trying to blow the ship up and so destroyed the pirate ship instead. He then took the ship with the passengers and the crew safely to their destination. Cyrus, a sea serpent, has to decide whether to allow pirates to destroy a ship with innocent people on board or help the ship get safely to its destination. This 46-page picture book, written from the third person point of view, shows the struggle of deciding whether to do the right thing or allow pirates to hurt innocent people. 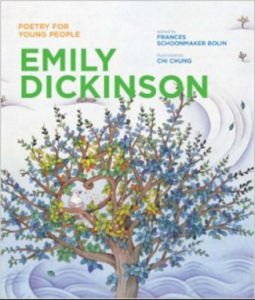 Recommended for readers aged 10 – 14 years old. “…hold on! Cried the Captain.” (17). “You Lubbers! Roared the Pirate Captain.” (30). “…twenty cannons exploded with a thundering BOOM…” (33). “…ships, he said, lots…” (3). “…he said’ – not unless…” (9). “…coming – great, towering wind – and…” (19). “…hull – KERWHAM – and…” (35). This book reminds me of a time when my Grandpa Brent from Penticton told me and my cousin Riley there was a lake monster called the Ogopogo. The legend says that the Ogopogo resides in the Okanagan Lake between Penticton and Kelowna and has been sighted by many people. My Grandpa described it as a fierce lake monster with a green snakelike body about 25 meters long, which is very similar to the way Cyrus the Sea Serpent looked in the illustrations in the book. Riley and I became afraid of this lake monster and thought it was dangerous and would tip our boat or eat us if we went for a swim. We did not want to go into the lake at all for several days until my Grandpa finally told us that its just a legend, so we were not scared anymore. 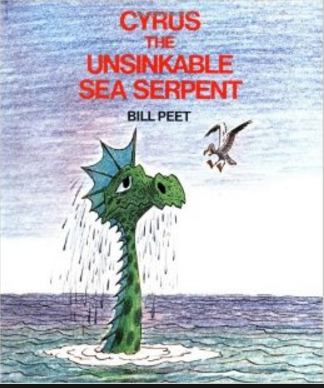 After reading this book, it made me wonder if the legend is actually true because there are many similar stories depicting a Sea Serpent type monster in lakes and oceans around the world. I wonder if Cyrus will appear one day and save a ship stranded in the ocean? Carrier, Roch. The Hockey Sweater. New York: Tundra Books, 1984. I know this author to be reliable because he is one of Canada’s best-known authors, with more than 30 books to his credit. He was also the first writer to head the Canada Council, the country’s major arts funding agency. This classic Canadian picture book is based on an original short story that became an animated short film. The category of the story is main character because this story is about a boy who gets the wrong sweater. All of Roch’s friends have Montreal red, white and blue sweaters, while he has a despised Toronto white and blue sweater. The reason he does not want to wear the Toronto white and blue sweater is because he lives in Montreal and the Montreal Canadiens always beat the Toronto Maple Leafs. This story is about a boy named Roch and how he is determined to get rid of that Toronto white and blue sweater. Roch, a 10 year old boy living in Montreal, has to decide whether to keep his Toronto white and blue sweater or to give it back to Monsieur Eaton. This 22-page picture book written from the first person point of view, shows that you should appreciate gifts even if you don’t like them. Recommended for readers 8 years old and up. “So, I had to wear…” (11). “When I arrived at the…” (13). “We were ten players all wearing the uniform of Montreal…” (3). “”there were already five players on the ice.” (15). “…worn the red, white…” (9). “…you try it, you…” (7). “…she did what she…” (5). “…skating-rink-but our real life was on the skating-rink” (1). “…next hockey game, lay out our next…” (1). “How could we forget that?” (3). “That was to much!” (15). “…places – the school, the church and the skating-rink – but…” (1). 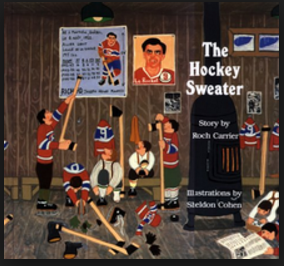 My connection to The Hockey Sweater by Roch Carrier is text to self. This book reminds me of a time when I was required to wear a baseball uniform and jersey that I did not want to wear. I was 10 years old and being drafted into the Major Division in my baseball league. I didn’t want to wear the blue Dodgers uniform and jersey because I knew there was a boy on the team who had bullied me the previous year. I also did not know how the coaches would be, so I was not happy about the decision to place me on the Dodger team. I was upset and angry and even considered quitting. When I told my parents they explained that we could tell the coaches that I did not want to be on the team. However, they added, the next year I might not get the same opportunity. This made me realize that I should have been thankful I had been drafted by the Dodger team coaches. Similarily, in the picture book, Roch did not like the Toronto white and blue jersey and wanted to return it to Monsieur Eaton, but he was afraid he might offend him and not get the opportunity for another jersey as a replacement. Napoli, Donna Jo. 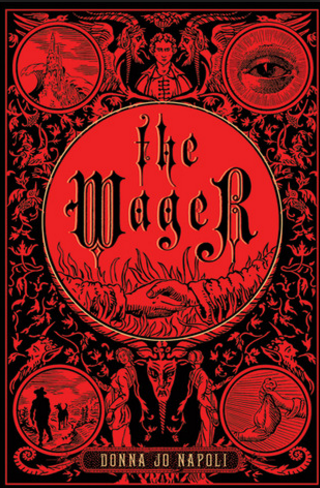 The Wager. New York: Henry Holt and Company, 2010. This novel is published by Henry Holt and Company, which began publishing in 1866, so it is one of the oldest publishing companies in the United States. It is known for publishing books that win awards and are written by famous authors, such as Robert Frost and Robert Louis Stevenson. The author of this book, Donna Jo Napoli, has won at least two literary awards, so I expect to find this novel to be well written. This novel is an example of a chronological pattern, main character, and problem-solving pattern book. The events in the story build on each other in a chronological pattern, with events related to each other. There is a main character, named Don Giovanni, who used to be the richest man in all of Sicily until a tsunami destroyed everything he had. He made a wager with the devil in order to regain what he had lost. I’m not sure you can call it person vs. person or person vs. nature, since it is the devil with whom he is wagering. There is one main problem throughout the story, which is solved at the very end of the book. Cultural concepts about Italy include continual references to a breakfast of stale bread and milk. I enjoyed the descriptive language that created clear visualizations that helped me to understand the story. The story was set in Messima, Italy, and that also grabbed my attention and appealed to me. I liked the unique struggles that occurred throughout the book. It was unpredictable and I found that kept my attention. The story is told from the third person, observer point of view. It was only fair; he’d served that one family for a month-so he’d earned those shoes and cape (59). He headed for the Jewish section of town (143). Don Giovanni shook his head vehemently (231). The story is told in the past tense. The first thing he saw upon opening his eyes was Ribi, sitting against the wall, staring at him (154). On All Saints and All Souls Day of 1171, Don Giovanni gave the biggest feast that Sicily had ever heard of (170). That afternoon Don Giovanni had his servants buy enormous wagons (196). ·“The shards still lay by the rock. Don Giovanni summoned every drop of strength…” (244). ·“The room was full, floor to ceiling” (147). “From every side sleet slashed like the thinnest knife blades” (153). “The girl who answered was neither pretty nor plain” (249). “It buffeted him. It whipped him. In the end it beat him senseless” (154). “The woman turned around and clasped her arms around the child and stared with a terrified face at Cani and Don Giovanni, as though they were the devil incarnate” (130). “A recluse in questionable clothing” (85). “They ranged from dirt poor to the king, from raving lunatics naked in the alleys to the most refined scholars and statesmen in their carriages” (128). “Not only was his food delicious, he’d managed to rid Don Giovanni of worms with a week’s regimen of garlic and hot peppers” (149). ” Summer rain was a phenomenon” (152). “The little cloud of flies that had come with the summer’s heat and circled his head right now could be his crown” (159). “More than a month later, on Christmas morning, Don Giovanni stretched out on the ground in the center of the courtyard of his villa, surrounded by the porticoed colonnade, and closed his eyes” (148). ·The man threw another orange, thump, at Don Giovanni’s forehead…” (244). “But you don’t dress like my other visitors expect. I get complaints” (84). “You showed up. Empty-handed. I knew you didn’t have the money” (146). “Three years, three months, three days” (112). “Stealing is wrong….Stealing is wrong” (247). This story was more difficult for me to connect with, due to the fact that it is set in the past, in Italy, where I have never been, and that the challenges the character faces are based on a wager with the devil. I haven’t read any other books with the devil, nor do I know anyone who has wagered with the devil that I can connect text to text, world or self with. The part that I could connect with was that the agreement Don Giovanni made was a contract. This I have two connections with. In a text to self connection, I have signed a behaviour contract for school, but also when I attend CISV mini camps and when I went to CISV Village in Fredericton for a month. I had to follow that contract and if I broke it, I would have consequences – the most severe being sent home from camp. I didn’t have a problem with following most of the rules, but at times I would have liked to have been able to email home and check my mom was okay. It wasn’t allowed in the contract, so I had to wait it out, like Don Giovanni had to wait until the time ran out on his wager. Bailey, Linda. The Vikings. Toronto: Kids Can Press Ltd, 2001. This outstanding nonfiction book can be categorized as following a chronological and main character pattern Part of the book is based on a time sequence and the other half is based on courageous characters. For example, “aroundeight hundred AD the people in this area…” or, “ Welcome to theage of the Vikings! !” “ these are a few examples of the time frame in the book. The main characters – Josh, Emma, Libby, and Julian – go on a vacation to the time of the Vikings and explore the harsh climates, the secrets and the responsibilities of that era. The amazing non-fiction book is based on true facts about the Vikings and their culture!! This book is written from the second person point of view. The Vikings are in the past, in history, but this book is written in the present tense. “ a Vikings is a farmer-with-a-fishing-boat-…” (13). “… find a feather…” (15). 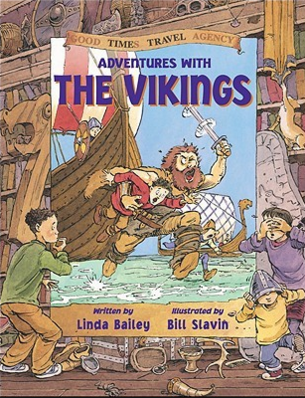 I can connect to this nonfiction book because the family life of the Vikings was much like my own today. The Vikings all helped out to clean, cook, and do the laundry. My family takes turns with household duties, too!